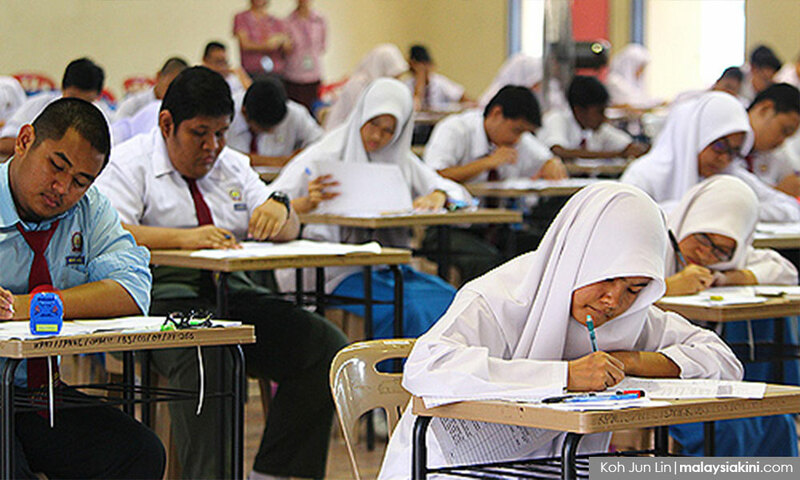 LETTER | The Malaysian education system has been rocked and dented by political interference. As a result, the medium of instruction and syllabi have been changed many times. However, these changes are not the only major disruption. At one time, teaching was the profession of last resort. Many of the teachers in this category are still in the teaching profession. The teaching of science and maths in English was scrapped, either for political reasons or simply because many of the “last resort” teachers could not handle the medium of instruction. New graduates at that time only wanted to teach Form 1 or 2. They refused to teach Form 4 or 5, let alone Form 6. In a very important national endeavour such as education, meritocracy should have been the top priority but our performances and results do not point to such a practice. Chaotic management is practised at all levels of the educational system, from schools to the ministry. In schools, the principals use their discretionary powers to call for staff meetings, religious activities or organising non-essential events. At the state and national levels, very often it's the teachers that are directed to attend meetings, seminars, courses, set exam questions and have sports activities all during school hours. The students and their timetables are ignored. Theoretically, relief teachers are supposed to teach, but can a Bahasa teacher teach English or vice- versa? The timetable that is not honoured means the teaching-learning experience becomes of secondary concern. The time wasted cannot be replaced. In the OECD Pisa score, we were ranked 52 out of 76 countries in 2015, way behind Vietnam, ranked 12. Singapore was ranked among the top countries. Why can't we be like Singapore? Why are we below a resource-poor nation like Vietnam? These are pertinent questions, educators should be asking. Instead, Malaysian educators question the validity of the Pisa scores. One of the nation's greatest failures is the teaching of languages. Many of the recent graduates who qualify in the professions can't string a sentence in English properly. Whether English is important is beside the point. It's nevertheless a national failure. The best way to revamp our education system is to start with the primary schools. Very strong emphasis should be placed on the 3R's, viz. Reading, Writing and Arithmetic. The 3R's are the foundations of education. Primary education should be spent on building up the students' educational foundation. A student with a strong foundation in the 3Rs would be able to progress very fast because their language abilities enable them to acquire knowledge with lesser effort. In the past, education was based on the 3Rs. Then, the many education ministers have begun to introduce other subjects such as history, moral studies, science and Agama, which they think are important. They dilute and muddle up the educational priorities of foundation building. No doubt, those subjects included could be important later on in life but they could have been postponed to secondary schooling. In any case, the subjects mentioned could easily be incorporated as part of language learning. In the process of learning the languages, a natural phenomenon such as photosynthesis, a historical event such as Merdeka, moral issues such as integrity and justice, could be learned indirectly. It's boring to emphasise on grammar alone in the mastery of a language. Many politicians are superficially concerned with unity and harmony of Malaysia as a nation. Blindly, they call for the termination of vernacular schools, which raises alarm and anger. That vernacular education is enshrined in the constitution is conveniently ignored. An alternative would be for all languages to be made available in primary schools with Malay and English as compulsory core languages. Optional languages could include Chinese, Tamil or Japanese. Students with weaker language foundations tend to resort to rote learning. Such an approach to learning is not only tedious but is devoid of understanding. Rote learning confines students to the lowest level in Bloom's Taxonomy of Education, which consists of a hierarchy of five domains, viz knowledge, understanding, application, analysis and synthesis. A student who fails to understand cannot progress to the higher level of application or analysis. Chaotic management can easily be overcome by having management courses for those who are supposed to be in education management. Educational leaders must have a basic knowledge of organisational aim, policies, strategies, motivation, teamwork, evaluation, time management and other success factors. Disruption of a timetable is not a factor for success. In this perspective, the Education Ministry should draw up its SOP (Standard Operation Procedure) or SO (Standing Orders). Educational management cannot be ad hoc or based on gut feelings. There should be a total revamp of the education system. International experts should be engaged to study the reasons for our educational decline. Teacher knowledge, teaching pedagogy, teacher training colleges and teacher management should be evaluated. Retraining courses, outside of the school timetable, should be made compulsory for educators found to be short of the required standards.